JazzErie is excited to announce that world renowned jazz violinist Christan Howes will be coming to Erie to put on, what is sure to be, a fantastic concert! 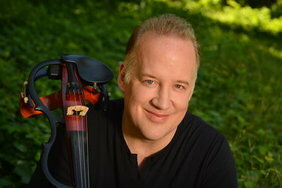 Christian will be performing on March 1st at 8pm in Walker Recital Hall on the campus of Mercyhurst University. Christian will also be putting on a free jazz/string educational workshop before the concert at 4:30pm in the Mercyhurst ensemble room located in the basement of the D’Angelo Performing Arts Center. This is the perfect opportunity to get some insight from a world class musician and artist such as Christian. This workshop is a great opportunity for aspiring jazz and string playing musicians to learn about this great art form. Tickets price for the concert will be $15 for non JazzErie members, $10 for JazzErie members, and $5 for students. Here is just a little bit about Christian and what you all are in store for! We can’t wait to see you all there! 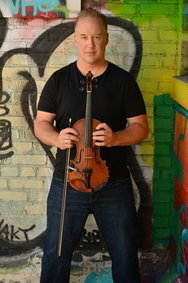 Christian Howes grew up in Columbus, Ohio, where he studied violin through the Suzuki method from the age of five, performed as a soloist with the Columbus Symphony Orchestra at age 16, and later earned his bachelor’s degree in Philosophy from the Ohio State University. During his teen years he began playing guitar and bass in rock, blues, and fusion bands. At age 20, he began playing violin in gospel church settings. These experiences ultimately led him to pursue a singular goal to become a versatile jazz musician and composer. Since then, he has gained respect from critics and players alike, establishing himself as a world-class jazz violinist and educator. From 2001-2009, Howes became an in-demand violinist on the New York scene, collaborating with a bevy of top shelf jazz artists, including Les Paul, Greg Osby, D.D. Jackson, Frank Vignola, Joel Harrison, Rez Abbasi, Dafnis Prieto, Spyro Gyra, and a 4-year chair in Bill Evans’ “Soulgrass” band. Christian was a favorite of Les Paul, with whom he worked closely for 11 years. Following a three-year tenure as Associate Professor at Berklee College of Music and after establishing his “street cred” in New York City, Christian returned to his hometown in order to be close to family and focus on his own projects. In August 2011, Christian was ranked as the #1 “Rising Star” violinist in the Downbeat Critics Poll and nominated for the Jazz Journalists Association’s “Violinist Of The Year”. In 2012, he was voted among the top three violinists in JazzTimes’ “Expanded Critics Poll“. The same year, he received the Residency Partner Award from Chamber Music America for his educational outreach with school orchestra programs. In 2013 he performed six nights under his own name at Jazz at Lincoln Center. Howes toured Ukraine (June 2014) and Montenegro (Spring 2015) at the invitation of the U.S. State Department, and in conjunction with the USArtists award from the Mid Atlantic Foundation. After releasing a string of independent releases as a leader, he signed with Resonance Records in 2008 and released four critically acclaimed albums. The first, “Heartfelt”, featuring pianist Roger Kellaway, showcases ballads and lyrical works. “Out of the Blue,” released in 2010, features guitarist Robben Ford, and demonstrates a wide range of sensibilities steeped in the blues. His 2012 release, “Southern Exposure,” featuring accordionist Richard Galliano, draws from a Hispanic sphere of influence. “American Spirit” was released in 2015, garnering a “Best of 2015” recognition from the Huffington Post, among other critical acclaim. In 2001, he founded the Creative Strings Workshop and Festival, which convenes during the first week of July every year in Columbus, Ohio. Says Howes, “The Creative Strings Workshop and Festival offers string players from Columbus and around the world an opportunity to study improvisation, composition, and styles outside the realm of classical music, while bringing the city of Columbus a plethora of talent and musical energy.” The annual summer conference is now in its 17th year, and draws participants from all corners of the earth, and it has since expanded into satellite locations around the world. Six events will be held in 2019 in Switzerland, Toronto, Dallas, Lincoln, Nebraska, and Asheville, NC. Howes also launched an online curriculum in 2011, the “Creative Strings Academy,” which is the largest resource of its kind, providing extensive curriculum for string players exploring jazz and improvised music. In 2014, Christian formalized his educational initiatives with the founding of Creative Strings, a 501(c)(3) non-profit organization dedicated to the expansion and improvement of music education. Through Creative Strings, Christian regularly visits school orchestra programs offering residencies combining collaborative performances with interactive clinics, rehearsals, and teacher training. He typically visits over 50 schools annually. Creative Strings also administers the podcast and annual workshops. Since 2007, he has also built an innovative online production business, which provides live string sections to music producers worldwide via a remote, collaborative orchestra. His Music Biz Mastermind courses took hold in 2015 and are now offered several times annually, helping working musicians design their careers while growing their impact. An active blogger, podcaster, and video content creator, he is frequently engaged to speak regarding music education and music business. He has worked with homeless, at-risk, and prison populations, as well as humanities departments at universities, incorporating diverse social causes and character education into his broad, inspirational message. This is sure to be a great concert that you won’t want to miss! See you on March 1st!